After days of having to cancel meal deliveries due to icy conditions and bitter cold temperatures, Meals on Wheels hopes to resume feeding clients on Monday. LEE’S SUMMIT, Mo. — After days of having to cancel meal deliveries due to icy conditions and bitter cold temperatures, Meals on Wheels hopes to resume feeding clients on Monday. Last week, the service cancelled deliveries from Wednesday to Friday. Susie Newsam of Meals on Wheels told 41 Action News last week that the conditions were too dangerous for the volunteers. Food recipients said they are eager to see the volunteers again with Meals on Wheels expected to resume deliveries. Wheeler suffered a stroke 12 years ago and has food delivered to her home in Lee’s Summit, Missouri. With the cancellations last week, her husband and his son stepped up to help. “If it weren’t for them, I don’t know what I would’ve done,” Wheeler said. Ahead of the deliveries this week, Newsam said volunteers knew the importance of their jobs and the people who depended on them. Wheeler certainly has a renewed appreciation for Meals on Wheels after last week’s cancellations. “You don’t realize how much you miss it until you can’t get it,” she said. 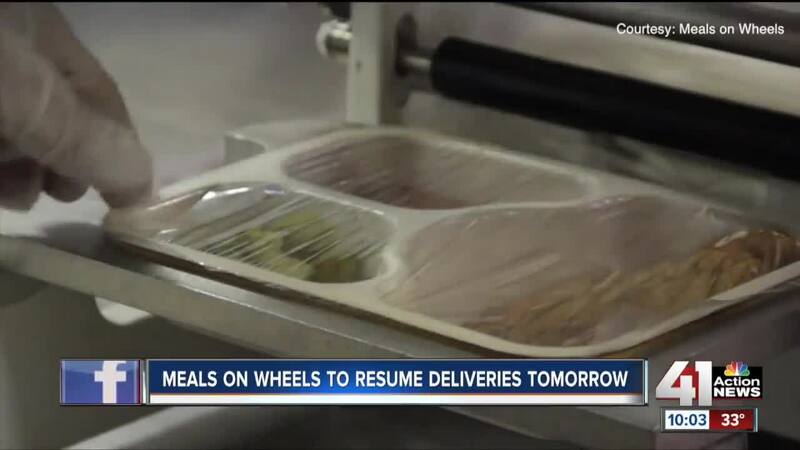 Meals on Wheels told 41 Action News that with winter still not over, it planned to possibly give clients emergency packets with canned goods for future days where deliveries are cancelled.